Billy Wynne has posted the “Thank God It’s Recess” edition of Health Wonk Review at Healthcare Lighthouse, a bi-weekly best of the health policy bloggers. Go there now to find out the latest scoop on the Affordable Care Act as the rubber hits the road. Plus, assorted other health policy issues. “National employers already benefiting by opting out of Texas’ workers’ compensation system are now pushing for “free market alternatives” to traditional state systems across the nation. They launched a new organization called the Association for Responsible Alternatives to Workers’ Compensation. ARAWC plans to lobby state legislators to allow employers to develop new options for delivering medical and wage replacement benefits to injured workers. Clinical Connections: What’s So Special about Specialty Managed Care in Work Comp? of delivery and financing in workers compensation? It would seem that bundled arrangements would be easier to implement than population‐based models, and furthermore they would more closely match the nature of WC events which are inherently episodic, not holistic. “If the diagnosis isn’t right, there’s a pretty good chance the treatment won’t be right. “Injured workers in California received nearly 20% of the $181.4 billion in medical and indemnity benefits paid by state and federal workers’ compensation programs between 2010 and 2012. Register for Business Insurance’ 5th annual virtual conference focused on workers comp and safety solutions is scheduled for October 8, a full day of webinars, audience Q&A and networking with peers that can help you better understand and manage the drivers for success in your workers comp and safety programs. People think CEO pay is out of control. The truth is much worse than they know. Is it legal to fire an employee for off-duty alcohol consumption? in her post How Americans die on the job, in 5 charts, Danielle Kurtzleben of Vox media analyzes and summarizes data from the Labor’ Department’s most recent preliminary Census of Fatal Occupational Injuries, 2013 The charts offer a quick look at of some of the most deadly jobs, activities and demographics. Cavalcade of Risk #217 is live, covering such wide-ranging topics from the Audacity of Dope to the state of the residual property market. Rebecca Shafer hosts at the WC Roundup blog – check it out! Over the years, we’ve devoted a few dozen posts to the issue of FedEx and its drivers. Here’s the issue in a nutshell: FedEx thinks its Ground drivers are independent contractors and the drivers generally disagree. For the eleven years we’ve been blogging, this issue has been wending its way through state courts, with a win for the company here, a win for the drivers there. On August 27, FedEx suffered a massive one-two punch at hands of the Ninth U.S. Circuit Court of Appeals in San Francisco, who overturned a lower court’s decision in Alexander v. FedEx, ruling that 2,300 drivers were indeed employees. Within a few days, the same court ruled that some 360 Oregon drivers were also employees (Slayman v. FedEx.) In making the ruling, the Court found that when the rubber hit the road, the lower court had overstated the entrepreneurial opportunities factor that benefited the so-called independent contractors. It apparently wasn’t enough of a benefit to sway the court. Contractors and small business are being chased down aggressively by state authorities (and rightly so, we think) to make them shoulder responsibility for employment obligations that other businesses carry. But in the land of the giant employers, many use independent contractor and subcontractor mechanisms to shield themselves from workers comp, Social Security, unemployment insurance, the provision of benefits like healthcare and paid vacation, and the obligation to protect workers in a variety of ways. For your further edification on this important issue, we defer to business and legal experts. We’ve gathered opinions and analyses from a variety of sources and offer excerpts. “FedEx is largely credited with having pioneered the “independent contractor” work model in the logistics industry. Under this system, workers function as self-employed drivers with their own routes, covering the costs of their own trucks, gasoline, uniforms and so forth. While corporations claim the contractor system gives drivers flexibility and strong incentives as “small businesses,” critics say it’s simply a way to shift the costs of employment onto workers and avoid payroll taxes and workers’-compensation costs. Employment Law Summer Recap 2014: Part 1 of 11 – FedEx sings Nico & Vinz’s “Am I Wrong”…to Classify Our Drivers as Independent Contractors? “It has become harder and harder for workers to tell who their employer is. Companies have engaged in vertical dis-integration as franchised businesses have become increasingly prominent and contracting out of operations by traditional firms has increased. The expanded reach of private equity funds as owners of Main Street companies has also undermined the traditional employment relationship. “This case also confirms that if you exercise any control over how workers perform services for you, it is likely that they should be classified as employees, not independent contractors. This distinction is important, because, unlike contractors, employee are subject to a host of employment laws, including the anti-discrimination laws, workers’ comp laws, and wage-and-hour (minimum wage and overtime) laws. Our condolences to all who lost loved ones on 9-11 — our thoughts particularly go to the many heroic 9-11 first responders – both those who lost their lives, and those who continue to suffer today with the mental and physical after-effects. Our thoughts also gravitate to the many in our industry who lost their lives while doing their jobs. Marsh lost 293 colleagues and 63 consultants and Aon lost 176 colleagues. Astounding still today. Hug a colleague in their memory. Be kind to those around you. Robert Hartwig and Claire Wilkinson of the Insurance Information Institute have produced some reports on the impact of 9/11 on the insurance industry – as well as the documented need for renewal of a terrorism insurance backstop. If you’re looking for something about workers’ compensation, might as well stop reading now, because this isn’t about workers’ compensation, although we know that 9/11 produced a slew of claims . I hope the song brings comfort on this sad anniversary. Trust for America’s Health and The Robert Wood Johnson Foundation recently released The State of Obesity: Better Policies for a Healthier America, a 136 page report that can be downloaded in PDF. 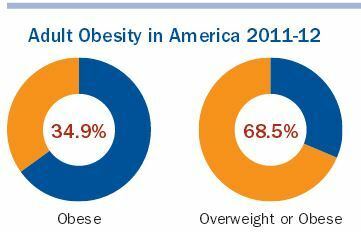 More than a third of adults (34.9 percent) were obese as of 2011 to 2012. 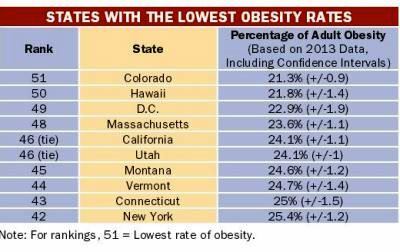 More than two-thirds of adults were overweight or obese (68.5 percent). 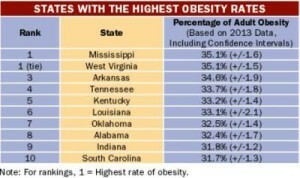 Two states have adult obesity rates above 35 percent (Mississippi and West Virginia), 20 states have rates at or above 30 percent, 42 states have rates above 25 percent and every state is above 20 percent. In 1980, no state was above 15 percent; in 1991, no state was above 20 percent; in 2000, no state was above 25 percent; and, in 2007, only Mississippi was above 30 percent. 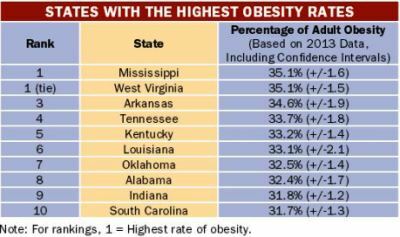 The 10 states with the highest rates of type 2 diabetes are all in the South. Alabama had the highest rate at 13.8 percent. Diabetes rates have nearly doubled in the past 20 years — from 5.5 percent in 1988 to 1994 to 9.3 percent in 2005 to 2010. More than 25 million American adults have diabetes and another 79 million have prediabetes. The CDC projects that one-in-three adults could have diabetes by 2050. One in four Americans has some form of cardiovascular disease. One in three adults has high blood pressure, a leading cause of stroke. Approximately 30 percent of cases of hypertension may be attributable to obesity, and the figure may be as high as 60 percent in men under age 45. People who are overweight are more likely to have high blood pressure, high levels of blood fats and high LDL (bad cholesterol), which are all risk factors for heart disease and stroke. The report contains significant detail about adult demographics and a special focus on childhood obesity rates, recommendations and policy initiatives. 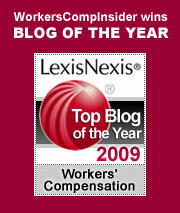 How does obesity affect workers’ comp? Here are a variety of studies, reports and news related to workers compensation and obesity – from our own pages and from other sources. .
Tim Dodge makes his CavRiskhosting debut with an impressive collection of risky posts: Cavalcade of Risk #216: Workers’ Comp, Cat Losses, Kayaks, and Did a Doctor Prescribe That Joint? As always, there’s sure to be something that strikes your fancy, so do check it out.